The idea germinated on December 12, 2015. We were at David and Lynn's house in east Texas visiting my brother and sister-in-law on our latest trip to the U.S. On this particular day, we all drove to Gonzalez, Louisiana, to be on hand for Chris's 40th birthday celebration. Chris is David's oldest son and, of course, my nephew. Yes, I have a 40 year-old-nephew, son of a younger brother. Reminds me how old (in years) I am. In typical south Louisiana December fashion, the party was held on the open air breezeway. I love that about Louisiana. When much of the country is freezing its buns off, the weather there is often balmy. Maybe that contributes to southern Louisiana people's Laissez Les Bon Temps Rouler (Let The Good Times Roll) attitude. It’s similar to the attitudes I love about people in Ecuador. The conversation, food, and beer flowed throughout the afternoon and early evening. Ahhh. I still miss Louisiana's relaxing winter afternoons. But, as the title may indicate to the astute, I didn't start this to write about Chris, or his birthday party, or even Louisiana. One of the attendees was Tessa, Chris's youngest half-sibling. Though not related to us by blood, Marilyn and I have always tried to treat Tessa, Libby, and Logan (all half siblings to Chris) as nieces and nephew. Tessa also had Daniel, her fiancé, with her. When she and Marilyn got to talking, guess what happened. Come on. If you know Marilyn, guess. It shouldn't be too hard. Got it, yet? That's right. Marilyn invited the happy couple to spend their upcoming honeymoon in Ecuador. Before I could finish my second beer (I've never drunk Mint Juleps), we were showing pictures of Ecuador from our computers to reinforce our glowing descriptions of the country's beauty. They were immediately persuaded, and Daniel's grandfather even said he'd buy their plane tickets as a wedding gift. Marilyn and I are not wedding planners, but we have planned more than our share of good trips, including trips with friends and trips by ourselves. Planning for another couple's honeymoon wouldn't be too hard. We only had to take one or two additional concepts into consideration, the first being "give them space". The last thing we wanted Tessita and Danielito to feel was that Tia Marilita and Tio Glenncito were keeping an eye on them. 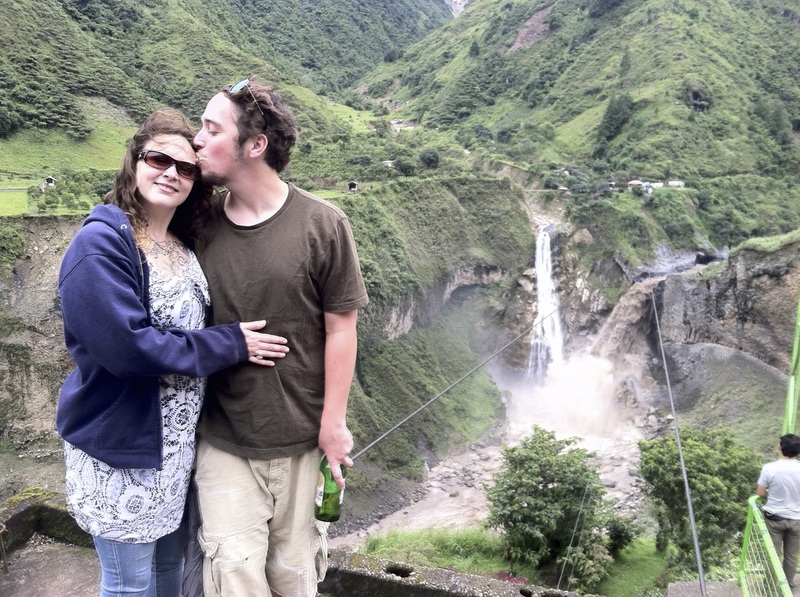 It was pretty special to simply share their happiness and take them to parts of Ecuador we thought were romantic. We made up itineraries (with actual and estimated costs) and sent them back and forth until they decided on what they'd like to experience in seven days. When things were settled, we made all necessary reservations in Ecuador. 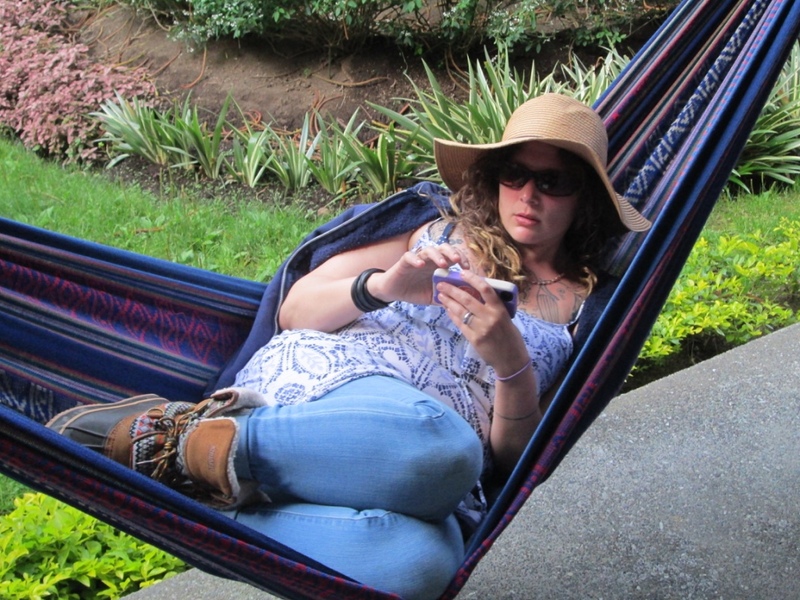 Then we sat back and waited until April 3rd, the day after Tessita y Danielito were married. We arrived at the airport on April 3rd, but, while they got there at 10:55 pm, we didn't see them until about 1:30 am on April 4th due to a 2 1/2 hour wait to get through customs. (It usually takes an hour.) What if they missed their connection in Atlanta after all? We knew it was short. I had pulled up a map of that sprawling airport and, to my consternation, had seen they were supposed to land at one end and had to leave from the other end - in an hour. What if they couldn't arrive until the next day? How would the schedule be rearranged? We did get comfort from the fact that hotel employees holding signs for expected guests stood with us for hours. Eventually, however, their guests emerged smiling (or dazed) and they left. When that happened, Marilyn started asking around and talked to a taxi driver who informed her that, due to Ecuador's budget shortfall, some customs workers (about half) had been furloughed. Tessita and Danielito finally emerged and we whisked them to the Hotel Ambassador in Quito for a short night's rest. One of the things Tessita commented on was that it was so quiet at the hotel, which was near the center of the sprawling city of Quito. I had never thought about it before, but she was right. Quito is loud in the daytime but is not an all-night city. Because of the problem with customs, we all decided to sleep a little longer in the morning instead of trying to do everything that had been planned during the first day. Still, we managed to hit some of Quito's most renowned touristic attractions: the Panecillo, the Basilica, Independence Square, and Iglesia De La Campania De Jesús. In the afternoon, we left on our four hour drive to Baños. 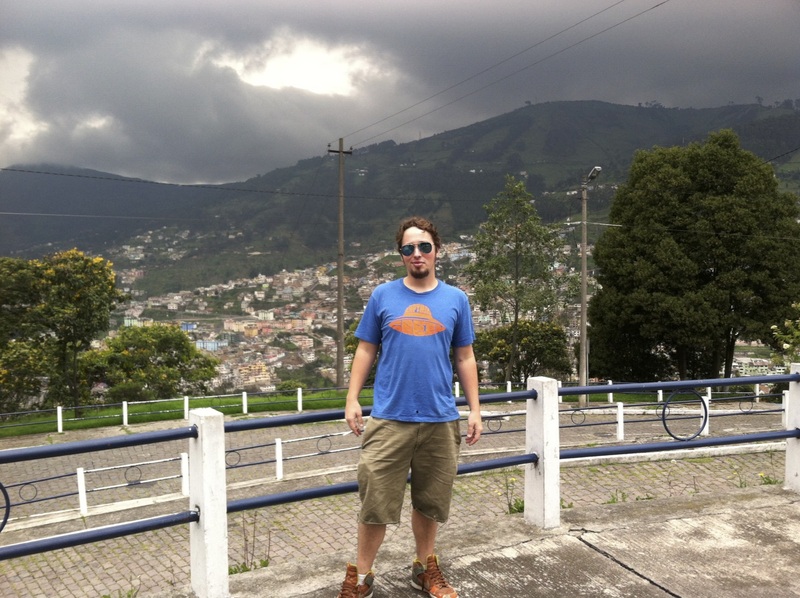 Dan At El Panecillo Overlooking Quito - His First Time Away From The U.S. 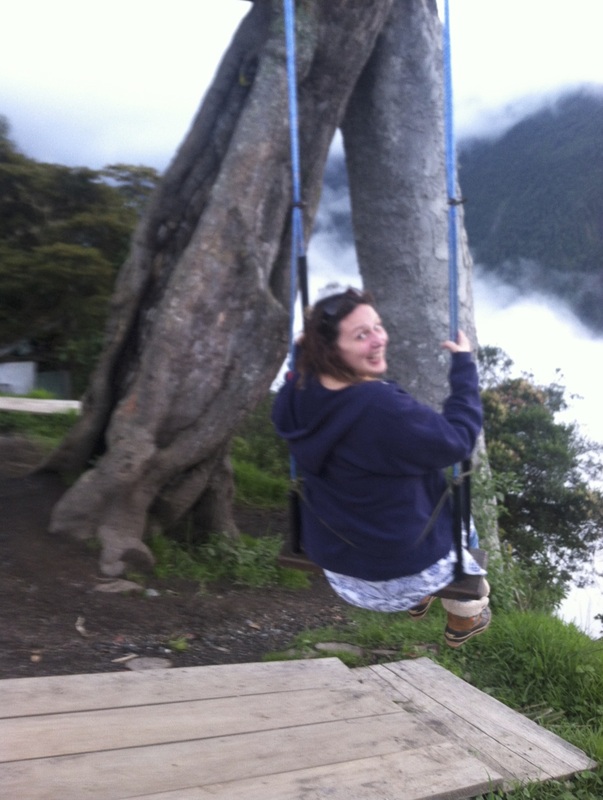 When putting together the itinerary, we knew they'd like Baños because Danielito y Tessita are adventurous. 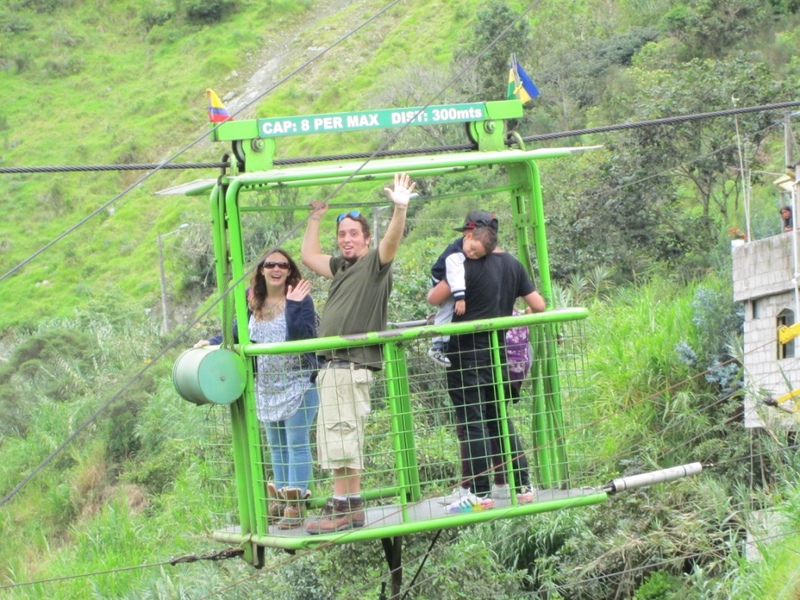 Baños has lots of fun things to do, including zip lining (canopy), bungee jumping, taking cable cars (tarabitas) across deep canyons, hiking (senderismo), viewing and playing in waterfalls (cascadas), cycling, 4-wheeling, rafting, short guided trips to the jungle (la selva), and, of course, pools (piscinas) fed by hot springs. So we allotted three nights and two days for Baños. That's not enough time to do everything, but it was a good portion of the time Tessita y Danielito spent in Ecuador. The first full day, we all took the Chebas Cascada Tour, which takes you to four different waterfalls. Sorry. 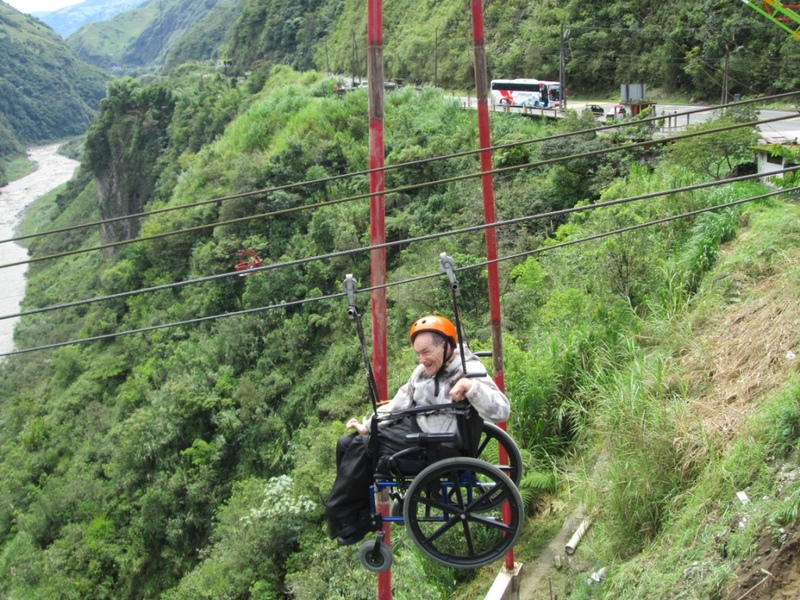 If we have guests and take them to Baños, it's a rule that they go on this tour. That's just the way it is. It's a double decker bus affording a fine view for those on the open air top. It makes stops at the cascadas, plus one or two other places. At practically every stop, one can do things like canopy, tarabitas, and bungee jumping. Tessita y Danielito did some canopy and tarabitas. I got out at one cascada (Manta De La Novia) intending to do a tarabita. The person running the concession asked me if I'd like to do canopy. Of course! 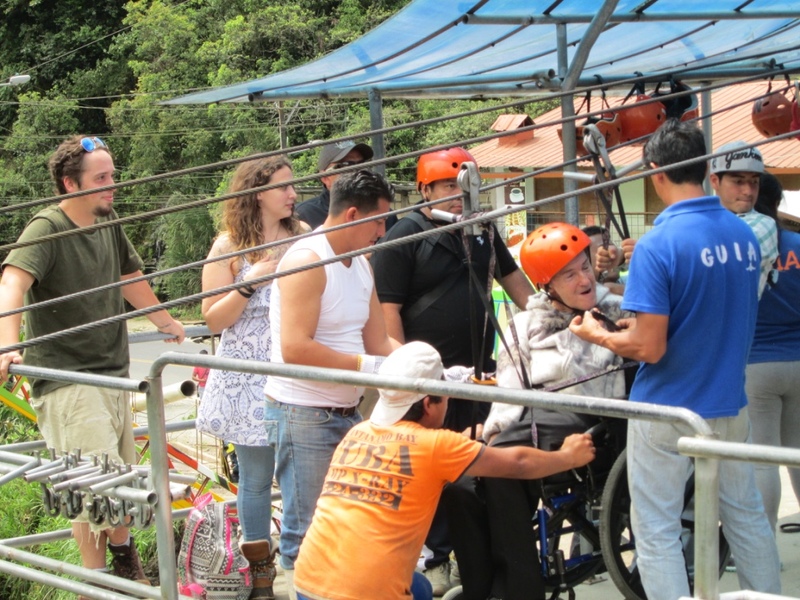 To my surprise and delight, I went in my wheelchair, cheered on by Tessita, Danielito, Marilyn, and a host of folks on our tour. I'll describe my experience in a different post. After the tour, we went to Casa de Arból. Danielito and Tessita really enjoyed that! It's a huge tree on the edge of a cliff with a treehouse and swing in it. The swing is situated so that when you swing forward you're in the air over a deep valley. It also has a good view of Tunguhuara, an active volcano. Baños is situated on the flank of Tunguhuara, another thing that makes Baños exciting. A little way down the mountain, we ate dinner at Cafe del Cielo (Cafe in the sky). This restaurant has a great view of Baños, especially at night. The next day, Marilyn and I hung around our hotel (La Floresta), while Danielito y Tessita did their thing. Actually, Marilyn had planned to hike but was tired. Therefore, I had company while I worked on my computer and read. The lovebirds went cycling. A little while later they came back with hang-dog looks, saying they couldn’t find a taxi to take them up the “hill” so they could bike down. I suggested they look for a white pickup truck with a green stripe. These often perform taxi services within a “parish”. That did the trick. They were driven as far as Cafe del Cielo, where we’d had dinner the previous night. The driver asked for $10, but Tessita and Danielito were so pleased that they gave him $20. After that, they said, they biked down the mountain at “breakneck speed” in under five minutes. I have my doubts about the time, but I have no doubt that it felt that fast to them. Tessita and Danielito rested in the hammocks of the hotel after that little adventure. Then they went to get a couple’s massage. We ate separately that night, primarily because Marilyn and I couldn’t find them. Later, they told us they’d walked by the restaurant and seen us eating but didn’t want to disturb our privacy. Sweetly, they were looking out for our privacy as much as we were looking out for theirs. The next day we piddled around downtown a little in the morning and saw a parade before leaving for Otavalo. That’s another thing about Ecuador that reminds me of New Orleans - anyone here will parade about anything, anywhere. And parades may not be scheduled in advance. This particular one appeared to be staged by healthcare workers. 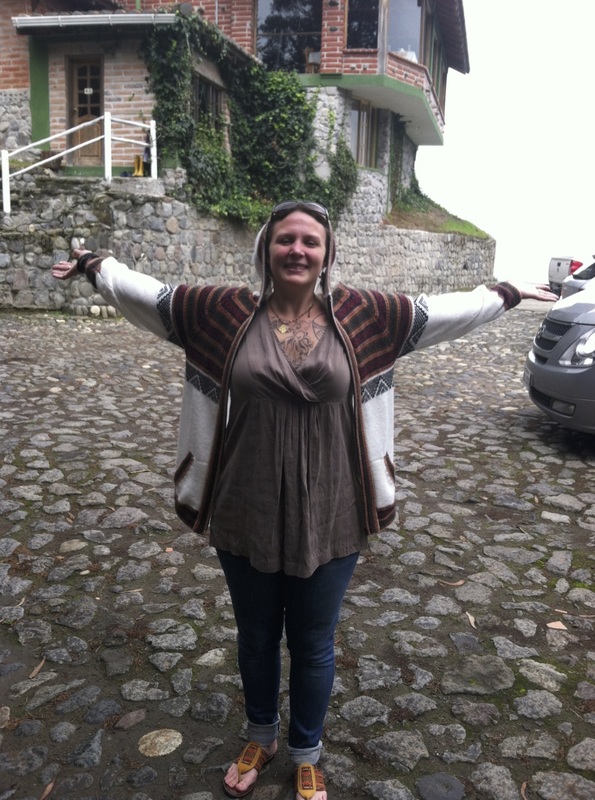 We stopped at Bosque Protector Jerúsalem (Jerusalem Protected Forest) on the way to Otavalo. Marilyn, Tessita, and Danielito went on a hike with the park naturalist, with whom we’ve become casually acquainted over the years. We had picked up Isabel on our way back through Quito, so she and I walked around a flat area near the administration buildings. Good thing we had picked up Isabel, because we were about to stop at our favorite tienda de flores in Tabucundo to get roses for the house and bodega (shop or storage area) when she told us she’d already gotten some in Otavalo. After all, that saved us a whopping $4.00-$5.00! Except at special times, like Easter, Mother’s Day, or the funeral of Hugo Chavéz, we can get 25 roses at this place for $2.00-$2.50. They last a week or more. I always laugh at Marilyn when she doesn’t want to spend $5.00 for 25 roses. I know husbands who might very well visit here just so they could shower their wives with roses at that price and become princes! Arriving in Otavalo, Danielito y Tessita got to meet Cesar y Luz, Isabel’s brother and sister-in-law, because we stopped at their restaurant to give them candies we had bought them in Baños. Next, we drove to their house and delivered candy to Maria Augusta, their daughter. We also needed to pick up Brayan, Isabel’s son, because he was visiting Maria Augusta until Isabel returned. Finally, we made it to our house and Tessita y Danielito got to see their digs for the next two nights - a two-room bodega. We’ve converted one room into a comfy, cozy bedroom and installed a half-bath in a corner of the other room. We figured the bodega bedroom would give them maximum privacy at our house. 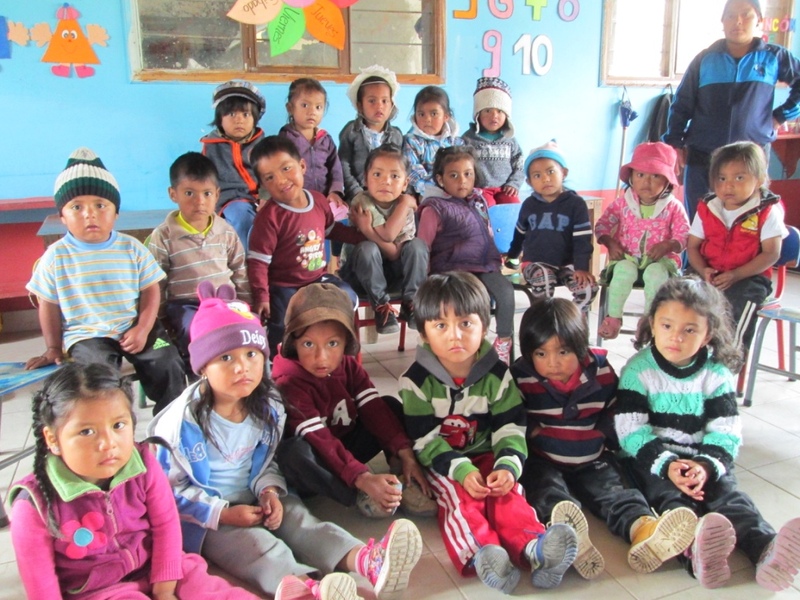 On Friday, Tessita y Danielito got to go to a couple of preschools where Marilyn teaches English as part of her work with FEDICE. They had brought some school supplies to hand out. They also brought fun stuff to blow bubbles as another way to interact with the kids. Tessita is an artist, has a degree in art, and has been working as a preschool teacher. 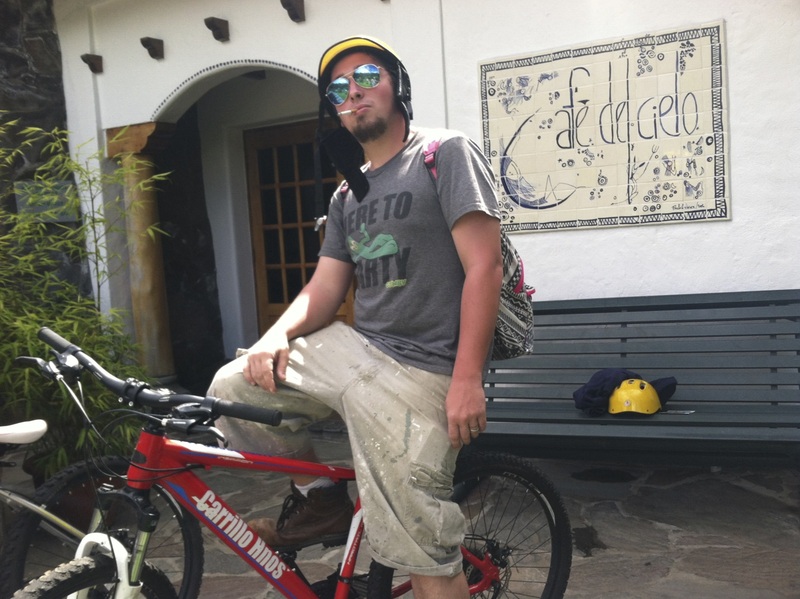 Danielito is an electrician, but has an artsy side as well. They were both in their elements at the preschools. Danielito y Tessita then went with Marilyn to Cotacachi to look at leather products because they’re less expensive than in the states. I think they bought at least one jacket, but I’m not sure. At night, we ate at Sisa, one of our favorite restaurants in town. On Friday and Saturday nights they have indigenous music groups performing, and we thought that Tessita y Danielito would enjoy hearing this often joyous music. 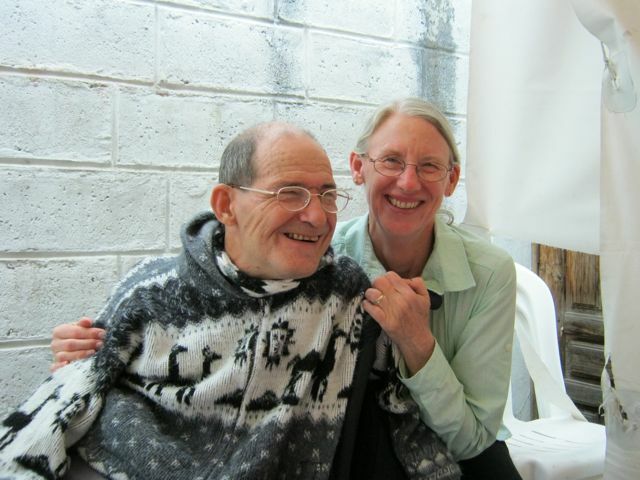 The day before they left, Marilyn took them to the huge Otavalo market and let them loose. They didn’t buy too much because of finances, but they had a wonderful time exploring. For lunch, Isabel, Brayan, y Patricia (Isabel’s sister) joined us for tilapia at an open air restaurant across the road from Lago Yahuarcocha (Blood Lake). A famous battle between the Incas and local Caranquis is said to have spilled so much blood that the lake, as big as it is, was tinged red. Brayan told us about a new attraction, called Botes Choqeuanda (Bumper Boats) that he was anxious to try, so we went there next. A small portion of the lake is roped off from the main body. The Bumper Boat consists of a platform surrounded by an inner tube-like structure. The platform consists of a seat and an outboard motor on a swivel. Once the motor is started, the driver guides the boat by turning the outboard motor on its swivel. They have seven of these Bumper Boats, so all of our crew (except Patricia and I) could participate at once. Looked like a blast! Just like Bumper Cars, except you could get wet. Then we took Danielito y Tessita to La Estelita. La Estelita is a hotel and restaurant high on a mountain with spectacular views of Ibarra and Lago Yahuarcocha. Marilyn and I had decided to give Tessita y Danielito one night there - alone - as our wedding gift. But, of course, we couldn’t just drop them off and leave them in peace. We just had to have a dessert there. When I noticed Tessita y Danielito fading fast, I said,”¡Vamanos!” and we finally got out of their hair. After they ate their dinner later, they went back to their Honeymoon Suite to find rose petals strewn artfully across their bed. 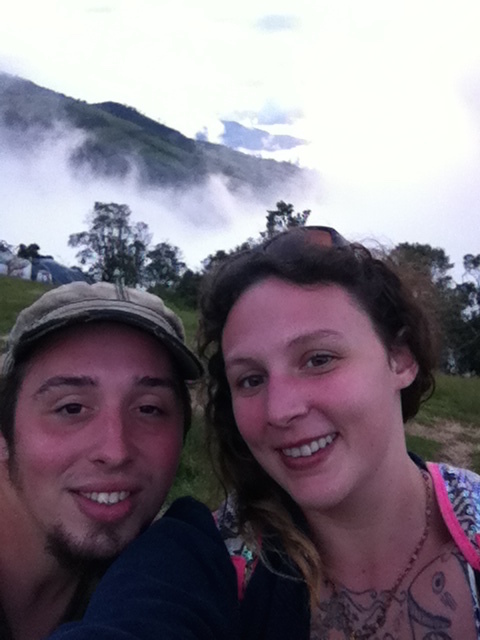 With that, and the views, Tessita y Danielito said it was a perfect way to spend the last night of their honeymoon. I wasn’t feeling well the next day, so Marilyn went alone to pick them up at 11:00 am. Before getting home, they went to 1) a cultural museum in Ibarra, 2) Rosalie Suarez for the best sorbet you’ve ever had, 3) our veterinarian for some medicine for Canela, our dog, and 4) a grocery store. With those last two items, it sounds like Marilyn was trying to gradually transition Tessita y Danielito to “real” life! We had a late lunch at the house when they returned. They rested and did some last minute packing. We ate a little more. Then we took them to the airport, an hour and a half drive. I was still not feeling up to par, but I was determined to say goodbye at the airport. We received an email from Tessita y Danielito saying that their honeymoon was unforgettable (in the best sense of the term). It is our prayer that they continue to make many wonderful memories together. Now, Terry and John, I’m calling you out. We know a wedding is in your future. We’ve already invited you to spend your honeymoon in Ecuador. We’ve added Honeymoon Planner to our resumés and gotten very good reviews. Coming? Wow, it sounds really awesome, neat, fantastic, etc. Of course Marilyn invited them to your country. Ya know I can believe that Marilyn had an issue with the high priced roses. That is our girl:) So glad you went ziplining over yonder rather than in CA because you know if GLenn can do it then of course I have to do it too:) I am one big chicken, cluck, cluck.